The GUARDIAN REALM has collapsed! As a barbarian STAR EMPIRE on the fringes of the galaxy, you must seize this opportunity to lead your kingdom to greatness. As you travel through the sectors of the galaxy towards the core, you will draft new technologies in the form of ships, vehicles, and robots, as well as recruit new infantry and heroes into your empire, preparing your forces for the final strike at the CORE WORLDS themselves. However, the six GALACTIC ORDERS of the REALM still exist, and they continue to wield tremendous power. Your fledgling EMPIRE must forge alliances with these powerful organizations, calling upon their aid when needed... or drawing upon their influence in the final push to assume the mantle of galactic supremacy! CORE WORLDS: GALACTIC ORDERS is the highly anticipated first expansion to the one of the galaxy's hottest new deck-building games! In this expansion, players will add Faction Tokens to the six Galactic Order Cards, each of which represents an organization that has maintained its independence in the midst of a crumbling empire. The tokens on each card can then be used to gain an immediate advantage granted by that Order, or they can be saved up to provide Empire Points at the end of the game. 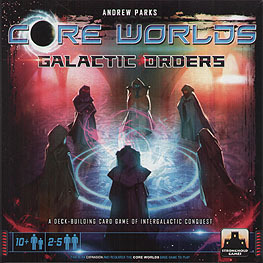 CORE WORLDS: GALACTIC ORDERS provides players with a greater variety of play and adds new tactical and strategic options to the game. The six Galactic Orders were represented in the core set by the six Prestige Cards: the Galactic Senate, the Science Guild, the Merchant Alliance, the Mining Coalition, the Order of Knighthood, and the Mystic Brotherhood. The CORE WORLDS expansion focuses on these six independent organizations and their influence upon a galaxy at war. and a custom cardboard insert to hold these components and all the components from the base game of CORE WORLDS!